21 items found searching fields on 2 pages. This economical general-purpose paging system by Apollo is typically used in restaurant, office, church nursery, clinical and industrial applications where inconspicuous pagers for restaurant servers, staff, guests, parents or patients may be worn and kept and used for hours or all day. This complete system kit includes the transmi... more. Restaurant server pagers alert your wait staff when food is ready so they can get it out fast and hot, yet spend more time with guests, improving customer service and increasing checks. FoodSoftware.com offers complete server paging systems for the lowest prices anywhere! Easier to install than most stereo systems- no wiring, constructi... more. 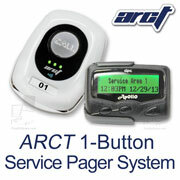 This general-purpose paging system by ARCT is typically used in restaurant, office, church nursery, clinical and industrial applications where inconspicuous pagers for staff, guests, parents or patients may be worn and kept and used for hours or all day. This complete system kit includes the transmitter, pagers and pager charger an... more. This system is ideal for simple paging requirements such as push-for-service restaurant table or service counter buttons. Small and rounded, the transmitter is pocket-friendly for mobile use. With its secure mount and small price, it can be installed on every table in your restaurant. The set includes one ARCT push-for-service t... more. This general purpose paging system is typically used in industrial, office, church nursery, clinical applications and restaurants where an inconspicuous, silent pager for staff, guests, parents or patients may be kept for hours or all day. This system combines a T9560EZ transmitter with Star pagers (small pagers that vibrate or beep and ... more. This system is ideal for simple paging requirements such as push-for-service service counter buttons or calling managers to the front of the house when things get busy. The set includes an LRS Yellow Butler XP one-button push-for-service transmitter and an alphanumeric text display pager with belt clip. The Butler XP is weatherproof and... more. This system is ideal for simple paging requirements such as push-for-service service counter buttons or calling managers to the front of the house when things get busy. The set includes an LRS PRONTO one-button push-for-service transmitter and one alphanumeric text display pager and program kit. The PRONTO can be flat- or wall-mounted.... more. Restaurant server pagers alert your wait staff when food is ready so they can get it out fast and hot, yet spend more time with guests, improving customer service and increasing checks. This is the lowest cost server pager system available anywhere! Easy to install - just plug it in!!!... more. This system is ideal for simple paging requirements such as push-for-service service counter buttons or calling managers to the front of the house when things get busy. The set includes an LRS PRONTO six-button push-for-service transmitter and one or more alphanumeric text display pagers and a program kit. The PRONTO can be flat- or wal... more. This listing is for individual Butler XP transmitters to create new staff paging systems or to add to your existing LRS pager system for expansion, replacement or upgrades. Place the Butler XP where you wish so anyone may contact your staff with the push of a button. LRS Butler XP one-button pager transmitters are great for both indoor ... more.